Media members took a ride on a Boston Whaler Realm powered by quad Mercury 350-hp Verados. If you want to want to get exposure in mainstream media outlets like TV stations, magazines and websites, you need to go to where the writers and editors are. For the third year in a row, Mercury Marine has brought a fleet of boats to Manhattan’s Chelsea Piers and invited a slew of mainstream media to go for rides on the Hudson River. The 2018 edition of the event took place Monday at the MarineMax dealership on Pier 59 at Chelsea Piers. Some of the more noteworthy outlets in attendance included CNBC, Fox Business, Bloomberg, Car and Driver, Harper’s Bazaar, Business Insider and ESPN.com. Lance Thomas, a professional basketball player for the New York Knicks, aboard his 40’ Invincible catamaran, Slangmagic. 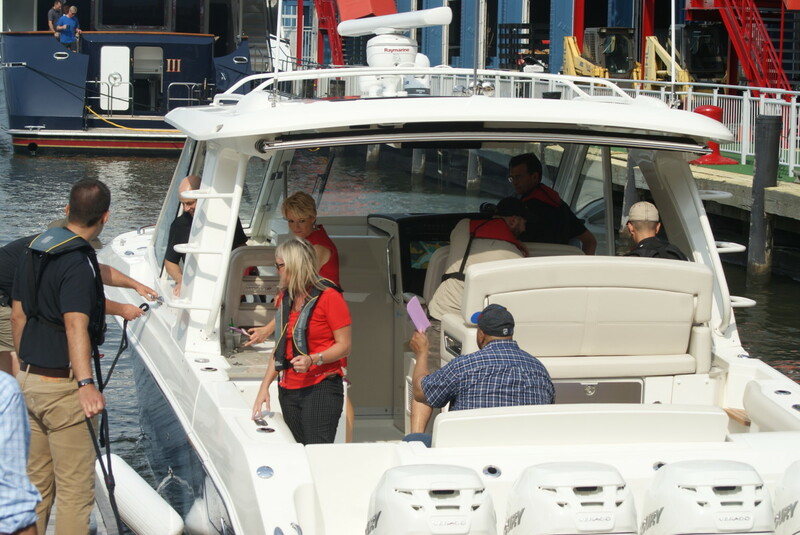 The technologies on board the boats included Mercury’s Joystick Piloting, Active Trim, Skyhook, Vessel View Mobile and the Nautic-On connectivity system that lets a boat owner or service technician access a boat’s on-board systems remotely. Members of the press had the chance to go for rides on a Boston Whaler 380 Realm powered by quad Mercury 350-hp Verado outboards, a Sea Ray 310 SLX with twin 250-hp outboards, a Mako 334 with quad 350-hp Verados, a Scout 355 LXF with triple 300-hp Verados and the most popular boat of the day, a 40’ Invincible catamaran powered by quad 350-hp Verados. The last boat is named Slangmagic and is owned by NBA player Lance Thomas, who grew up fishing in New Jersey and New York. Thomas now plays for the Knicks. He spent the day at Pier 59 giving interviews and posing for photos. The Slangmagic team competes in tournaments all over the country. Thomas is a hands-on boater who is passionate about fishing. During his first time playing in the NBA with the New Orleans Hornets, Thomas discovered offshore fishing. His first yellowfin tuna weighed just over 107 pounds. “From then, I was calling all the charter captains, ‘Hey when can I go out again? I want to deck hand, I want to learn,’” he said. The soft-spoken Thomas started his boating career with a 25-foot Sea Hunt and moved up to a 32’ Yellowfin center console before buying the Invincible earlier this year. In three months, he’s put more than 400 hours on the boat. The name Slangmagic comes from a song by an underground group from New Jersey. By day’s end, more than 30 magazines, television stations and websites had attended the event.